Australian Oscar Piastri will drive for Ricky Flynn Motorsport for the 2016 European karting season. After sharing his driving commitments between Australia and Europe this year, the 14 year old Victorian has committed to the full 2016 European calendar and will relocate to Europe to drive the FA Kart for the highly regarded British team. Piastri has chalked up some great success in the junior ranks this year, his first full year in the highly competitive KF-Junior class. A top ten finish at the European Championship race in Portugal, a stunning victory in the opening round of the Australian Championships, the Victorian State Championship, back-to-back victories at the City of Melbourne titles, first place at the Gold Coast Race of Stars, winner of Junior Top Guns, Top Qualifier and overall third in the Australian Championships all results of his skills and determination. He also attended the CAMS Junior Academy Development Camp and represented Karting Australia on the grid of the Melbourne Formula 1 race with other young karters earlier in the year. Ricky Flynn Motorsport is also no stranger to success, with back-to-back KF Junior World Championships, KF World Championship and a European Championship over the last two years they are a prime contender for further success in 2016. Running the FA Kart and Vortex prepared by ONE Engines, RFM is a truly professional team that leaves nothing to chance, highly respected in the paddock and always seen fighting for victory at international karting events. “This is a fantastic opportunity for me to take my driving to the next level. Ricky Flynn Motorsport is one of those teams that you see in the European paddock and you just know they mean business and then you race alongside their drivers on the track and you see the results. It will be amazing to actually be one of their drivers next year. 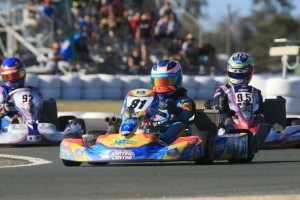 I’m also really happy to be driving the FA Kart chassis, the kart I’ve had so much success in Australia with my mentor James Sera and the JSKC team”, said Oscar.